All steel construction uses standard 3/4” pipe. With hot dip galvanized finish. 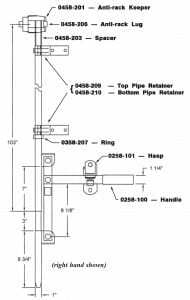 Pipe assembly includes: Pipe weldment, top lug, top keeper, two pipe retainers, handle and hasp. 458-206 Top Lug, 458-203 Spacer, 358-207 ring, all supplied loose.